Martin Booth’s international bestselling memoir, Gweilo, is a page-turner and a veracious read for anyone who has experienced the excitement that comes with learning about a new culture. Once a vulgar way to describe Westerners and their ‘ghostly’ skin complexions, gweilo, or the feminine gweipor, is Cantonese slang that refers to foreigners in general. Luminous in its descriptions and enthralling in its evocations, Gweilo invites readers to appreciate colourful sights and eccentricities that imprinted themselves onto Booth’s childhood memory. Booth’s approach to the style of memoir is unique: concerned less with personal triumphs and difficulties, focusing instead on what he perceived and the things he was fortunate to see. Shipped to Hong Kong as a seven-year-old, he is curious to see his world stretch beyond the confines of England and into a post-Second World War Hong Kong. Earnest to devour every wonder and rarity the charismatic city has to offer, Booth becomes a collector of observations. As his story commences, there is already a clear establishment of his position as an observer rather than a subject, inviting us to situate ourselves in the very places he once stood. This is effective, since Gweilo is not merely a childhood memoir charged with personal anecdotes, but also culturally significant and celebratory of Hong Kong. Gweilo particularly shines in its determination to document both the characters and sights Booth encountered and appreciated as a child vividly. Wandering aimlessly, he recalls marveling at the many cultural attractions offered in Hong Kong, where the air was thick with incense smoke, exotic foods, and herbal medicine. He tells stories of being fascinated by spectacles such as the flamboyantly dressed actors in Chinese Operas, or “combatants whirling” in fight scenes to celebrate Chinese New Year. He also talks of his experiences with Chinese Medicine, scanning street corners, and meeting an array of personalities: tramps, refugee squatters, or even superstitious people touching his golden hair-locks for luck. Moreover, he documents many of the issues facing a 1950s Hong Kong, such as a closely situated, post-Mao China, and poverty as a result of income inequality. The Hong Kong that Booth describes is different to today’s, which has now discovered and implemented itself onto the world’s economic and industrial stage. Transformed into an international powerhouse, Hong Kong has experienced an influx in expatriates, giving way to a kind of gweilo culture that perpetuates itself as more expatriates settle and call the city ‘home’. Although there were less expatriates in the 1950s, the division between foreigners and locals was still fairly pronounced. Through Booth’s resentful portrayal of his father, he not only addresses, but also comments on this gap. While admittedly the black and white portrayal of Booth’s father was frustrating at times, the domestic conflict in the novel highlights the choice, if not responsibility that comes with being a gweilo. Like many Europeans moving to Hong Kong in the 1950s, Booth’s father was an Admiralty Clerk and a Hong Kong-made aristocrat. Able to ascend the social class ladder as a foreigner, he was suddenly able to live as an upper-class citizen entitled to Chinese servants and a home in the tallest skyscrapers. Although my experience as a gweipor was more like Booth’s in my eagerness to explore the city, the idea of being afforded luxuries otherwise unavailable to Western society is not a foreign concept (no pun intended). Booth’s father wears his Gweilo identity like a superiority badge, taking pride in the power that comes with his Western title. Narrow-minded and bigoted, he has no interest in learning or appreciating Hong Kong beyond his office and apartment, an attitude that foils Booth’s mother. While Booth’s father is condescending about the facts he has memorized regarding the places he has travelled, Booth’s mother advocates learning that comes from taking risks and being street smart. Having an appetite for discovery and adventure, she engages with locals and befriends Chinese servants, waiters, and shopkeepers; choosing full immersion over a sheltered gweilo life. In this antithesis, Booth stresses that the best way to learn is to interact with people who physically exude the culture. 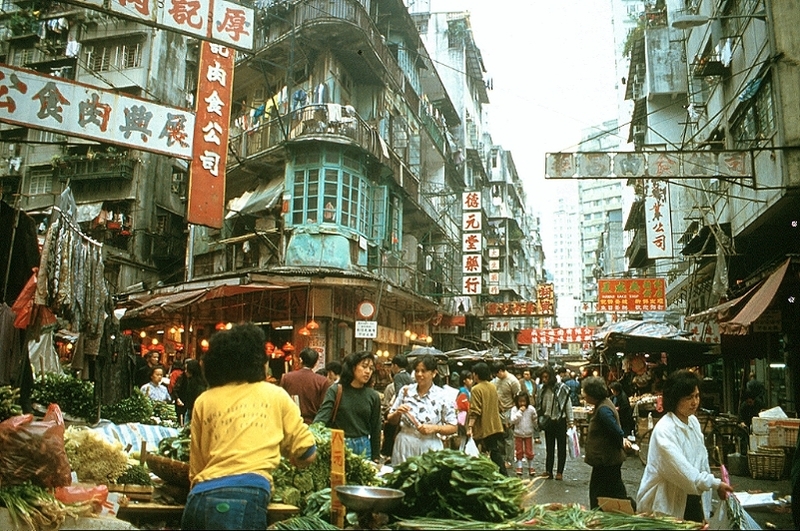 Booth’s decision to be an explorer is what gained him access to the intricacies of Hong Kong. It is as if Booth is saying “chase the city; it is alive and bustling.” In documenting his story, he encourages us to find the explorer within ourselves; and as a result, perhaps, another ‘home’ in a foreign country.